Wastewater management specialist ACO Marine unveiled at the METSTRADE 2018 a range of new vacuum toilets for the luxury yacht market, in a development that marks the sector’s first-ever ‘intelligent’ sanitation system. The new ‘smart toilet’, part of the ACO AVT range of vacuum toilets, has been designed and manufactured in-house to complete the German-headquartered company’s marine sanitation package. Its yacht portfolio includes high-end vacuum and gravity-based toilets, vacuum generation, pumps, holding tanks, grease separators and membrane bioreactors through to pipework, scuppers, channels and waste stream transfer systems. Based on sophisticated electronics, sensors and autonomous technology, the AVT Smart100, has been designed to meet market demand from luxury yacht operators, builders and crew for a low-noise, “smart” toilet system capable of intelligent operation. The ACO AVT150 range is the super silent variant targeted at the luxury end of the market. 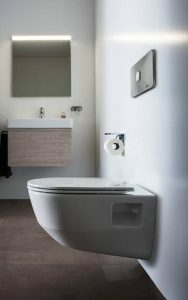 Compared to existing vacuum toilets, the AVT Smart100 toilet uses unique operating and control algorithms to reduce significantly the maintenance requirement. For instance, the series has fewer components than competing systems, and, critically, does not rely on pneumatic valves – the component most prone to failure in traditional units. Instead, each system operates a patent-protected self-closing/opening pressure valve for direct flushing. It is the diagnostics function of the intelligent AVT Smart100, however, that is expected to set the standard in a yacht sanitation. Incorporating a fully-programmable microchip in the control system, crews can, for the first time, remotely control, monitor and maintain all the toilet’s functions. Operators can adjust flushing and suction sequences, adjust water pressures and supply and monitor the condition of each toilet connected to vessel’s wastewater system. Typically, yacht crews would have to trace the system back to find which toilet had malfunctioned or wait for the owner or guests to report a problem.